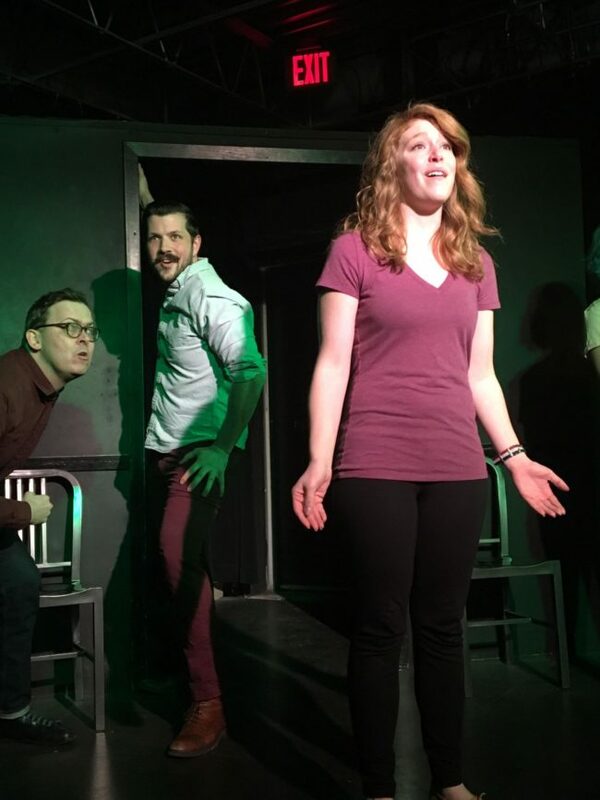 One of the great things about improv is that it results in shows that are never the same twice—which really takes the pressure off a reviewer vis-à-vis any possible spoiler infractions. More surprising to those unfamiliar with the form is how, in the hands of skilled artists, what results from a simple topic suggestion is a strangely coherent melange of a show that is astonishingly fun for both audience and actor alike. 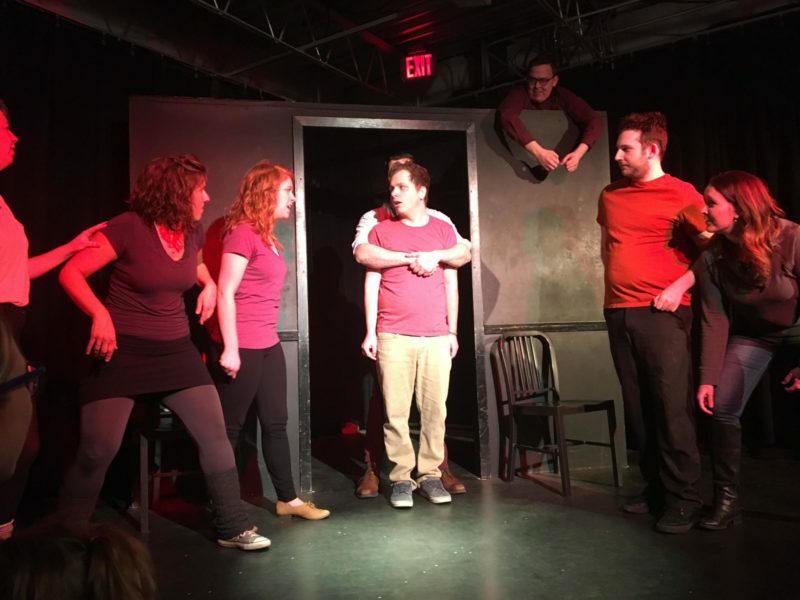 Rated G: The Improvised Family Friendly Musical, performing Saturdays in March and April at HUGE Theater in Minneapolis, is a perfect example. 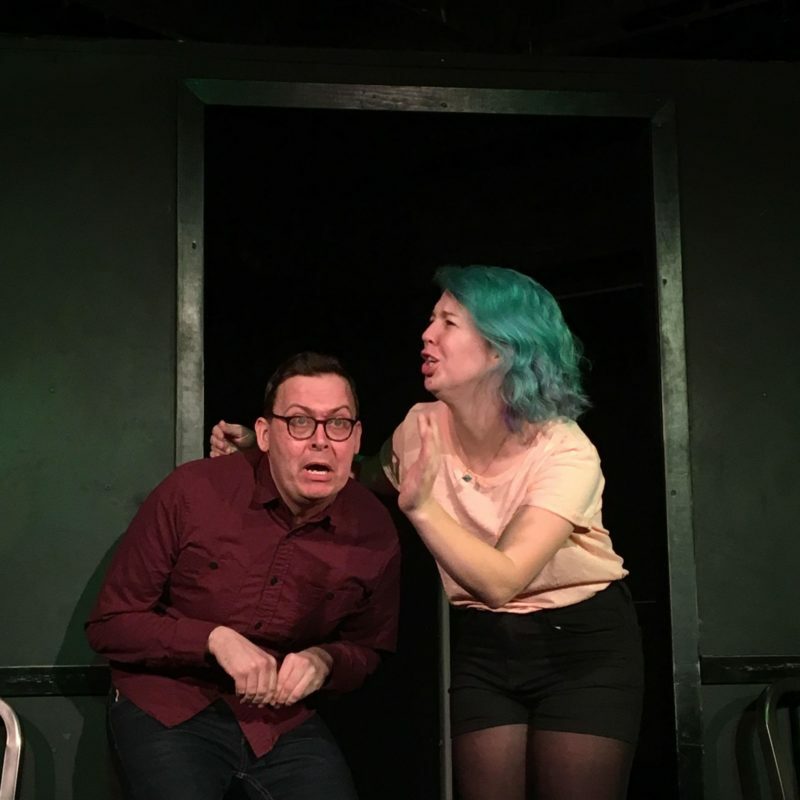 Directed by Doug Neithercott and performed with infectious enthusiasm by cast members Sami Haeli, Edd Jones, Erin Kennedy, Seniz Lennes, Phillip Schramm, Mark Sweeney, Drew Tenenbaum, and Meghan Wolff, the show is hilariously delightful. When you enter the theater, you’re asked to “write down a music adventure that has never been made.” I tossed in my contribution (“Mary Poppins: The Next Generation”) and took my seat accompanied by a medley of They Might Be Giants songs. The place was packed, mostly with adults but with a few kids sprinkled here and there. When the lights dimmed, Erin Kennedy offered the bucket to a very young girl in the front row. She didn’t select my suggestion, but I have no regrets, as the one she did choose—“Nature, Forest Jungle Show”—was a solid premise eagerly and immediately embraced by the full cast in a rousing opening song. A great source of amusement in the show was how we could see the plot develop organically as the players riffed off each other. (I use the term “players” advisedly, because they certainly seemed to be having as much fun as the audience was with seeing where things would go next.) You might think an instant show with no preparation and just a premise to go on would be nothing but chaos, yet it all came together amazingly seamlessly. This is due to the inherent nature of improv, in which the entire cast is as eager to support each other as they are to take their own time in the spotlight. The musical numbers ranged from all-cast ensembles to duets and solos accompanied or counterpointed by the chorus—made up of the “offstage” actors, lined up against the back wall and staying out of sight until they felt it was the right time to step forward again. Here I should mention the talents of musical director and keyboardist John Hilsen, whose skills contributed in no small way to the smooth integration of the songs into the larger show. So what was the show about? Well, from the “Nature, Forest Jungle Show” premise, the full cast immediately launched into a song about nature and the jungle, with one actor (Sami Haeli) choosing to characterize herself as an aspiring scientist. The scientist turned out to be 16-year-old Jezebel, or Esme, depending on whether the actor onstage remembered her just-created name (eventually a compromise was reached with “Jezme”). She lived in the jungle with her grandmother (Kennedy), as her parents had disappeared into the jungle years before. Enter villain Nancy Jungle (Drew Tenenbaum), who, having gotten lost because of a faulty GPS early in life, hated machines and was determined—with sidekick monkeys Ezra 1 and 2 (Seniz Lennes and Kennedy)—to keep the jungle free of them. Further complicating matters, a robot (Meghan Wolff) and her pet ferret (Mark Sweeney), lost in the jungle, meet Jezme and tell her of the delights of science-based city life but are subsequently captured by Nancy Jungle. Jezme, distraught, fashions a triple-robot machine (Phillip Schramm, Jones, and Sweeney) out of “wishes and science” and sets off to rescue her, ultimately discovering that the robot’s creators are her long-lost parents as well. Nancy Jungle is converted into a machine himself and jumps into a volcano, while the family sings a closing song of happy reunification. Think that plot is weird? Try slogging through Wagner’s Die Ring des Nibelungen sometime. In comparison, this was a straightforward walk through the park (or jungle, as it were). Now, since this is improv, the show will be entirely different next time, so why did I take you through the entire plot? To show you how the skillful actors managed not only to cobble together a reasonably coherent—if absurd—story but also to make it genuinely emotionally compelling and wholly entertaining throughout. Once the show ended, the players sought out the contributor of the original premise, who turned out to be another very young girl up in the front. She received applause and a poster to take home. I’m not sure that younger kids will necessarily “get” a lot of the humor, arising as it frequently did from an appreciation of how yet another character or twist was bolted onto the already-unwieldy plot structure. But show has singing, dancing, and grownups acting silly, so they will likely be carried along in the general wave of enjoyment regardless. And at 45 minutes long, they won’t have time to get too restless. I highly recommend you attend, with or without a kid in tow. You’ll have a laugh-out-loud good time. And hey, if there are any producers out there who want to develop “Mary Poppins: TNG”? Give my people a call. We’ll talk. Rated G will be performed at 6:30 p.m. on March 10, 17, and 31 and April 7, 14, 21, and 28 at HUGE Theater, 3037 Lyndale Avenue South, Minneapolis. Thanks for the correction—and sorry for the error! We will update the caption.